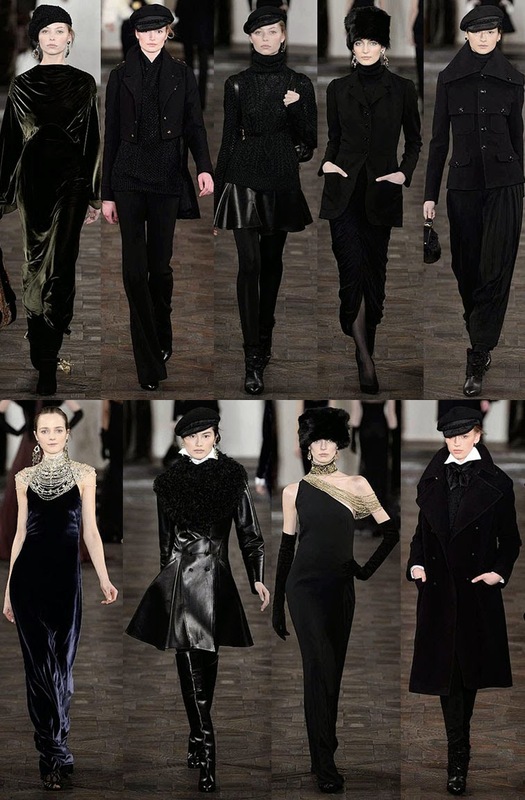 I'd like to take moment to revisit one of my favorite fall collections: Ralph Lauren. I always really appreciate his aesthetic, as he completely epitomizes the American Dream, the Waspy country club look, the wild wild west, the image of Americana, I could go on -- however, his fall 2013 collection was so dark, imbued with mystery, regal, even. Above all, it was simply stunning. With the inevitable equestrian references, there were also touches of Parisian schoolboy elements, as well as pieces evocative of Russian tzarinas meet Gilligan's Island. Essentially all good things in life encompassed in one flawless collection by one of fashion's masters. Can I look like this when the mercury drops? Thanks. Great post, love this collection! oh the last dress is fantastic!♥ beautiful collection! OH wasen't the collection amazing?! The crushed velvet was just beaut. RL is my favourite designer!! !